Phantasy Star Online 2 is the hottest game to hit the market. Just ask anyone at Seiga Academy anyone except for Itsuki Tachibana, that is. Unlike his peers, Itsuki does not play video games and ended up missing out on this big trend. Thankfully, he has other good qualities. He gets good grades. He has perfect attendance. And, to the delight of his friends, he makes the perfect substitute for any afterschool activity. Who knew it was possible to be a jack of all trades in high school clubs? Itsuki's abilities attract the attention of student council president, Rina Izumi. While Itsuki is the perfect image of mediocrity, Rina is a vision of excellence; she is good looking, popular, an amazing athlete, and she has excellent grades. There is nothing she cannot do... except for keep an eye on the extracurricular activities of the student body, of course. 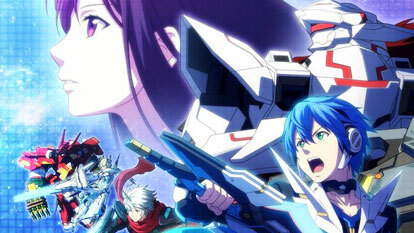 Rina recruits Itsuki as the new vice president of the student council and asks him to play Phantasy Star Online 2. Because the game is an MMO, it has a social aspect and she wants to know if it is affecting the student body negatively. But first, Itsuki has to learn how to play the game! Will this jack of all trades pick up a new skill? Is the game just an unwanted distraction to the student body? Find out in Phantasy Star Online 2 The Animation!